Awareness For Fibromyalgia – What Is It Good For? I love the idea of fibromyalgia awareness. That’s because many people living with this disease are not met with understanding. They may look well. But they feel terrible. Pain is one symptom. It’s the hallmark of this disease. But chronic fatigue is another. However, this condition is often coupled with insomnia. None of these symptoms necessarily show up on the body. Having fibromyalgia makes it extremely difficult to hold a 9 to 5 day job. Many people still do. I give them a lot of credit for dragging themselves to work and being productive. However, a significant proportion of people with fibro cannot work. They’re disabled. Yet, because they look so well, they’re often accused of being lazy. For these reasons, I love the idea of fibromyalgia awareness. On the other hand, I hate the idea of fibromyalgia awareness. That’s because I think it’s a distraction. Don’t get me wrong. I love purple butterflies. I even have one on this site, right on top. But, in my honest opinion, purple butterflies and ribbons are a diversion. Instead of these purple symbols, we need better treatments. All too often, people with fibromyalgia are pumped up with drugs. These may relieve the immediate symptoms. But they don’t hit the root cause. Also, drugs can create new symptoms, known as side effects. These can be even worse than the original problem. Unfortunately, mainstream medicine is drug oriented. So, if a patient visits a doctor, he or she is likely to leave with a prescription. The best doctors also offer advice for improving your overall health. But many physicians don’t do that. This is where I think fibromyalgia awareness campaigns fall short. What good is “awareness” if most patients don’t get the right kind of help? In a perfect world, everyone would have good health insurance. Then, they’d be able to use this coverage to obtain the care they need. But that’s far from the case today. Typically, patients who want to use natural remedies, instead of drugs, are on their own. Their regular doctor may or may not support them. Or he or she may not know much about natural healing, since medical schools teach them more about drugs. So there’s definitely a need for greater awareness among physicians, that natural remedies exist and that they can help. This lack of awareness is a great source of frustration for many patients. So, what generally happens is the patient sees an alternative medicine specialist. It’s a rare insurance plan that will cover these visits and treatment costs. I love purple butterflies. I think they’re a beautiful symbol of fibromyalgia awareness. I hope they don’t away. But no worries about that. It seems as if they’re popping up everywhere, on coffee mugs, clothing and jewelry. (I’ve even designed a few purple butterfly gift items myself.) These butterflies are designed to raise awareness of fibromyalgia. That’s generally a good thing. At the same time, there’s a lot of focus on butterflies. As lovely as they are, it doesn’t change the fact that mainstream medicine isn’t offering good solutions. Personally, I think it’s criminal that health insurance offers great coverage for drugs, which don’t seem to make us well again. But we pay out of pocket for drug-free holistic health care. Some of us are fortunate enough to live in an area that requires coverage for chiropractic treatments. I’m blessed that I can see a chiropractor under my insurance plan. I’m acutely aware that not everyone has this luxury. 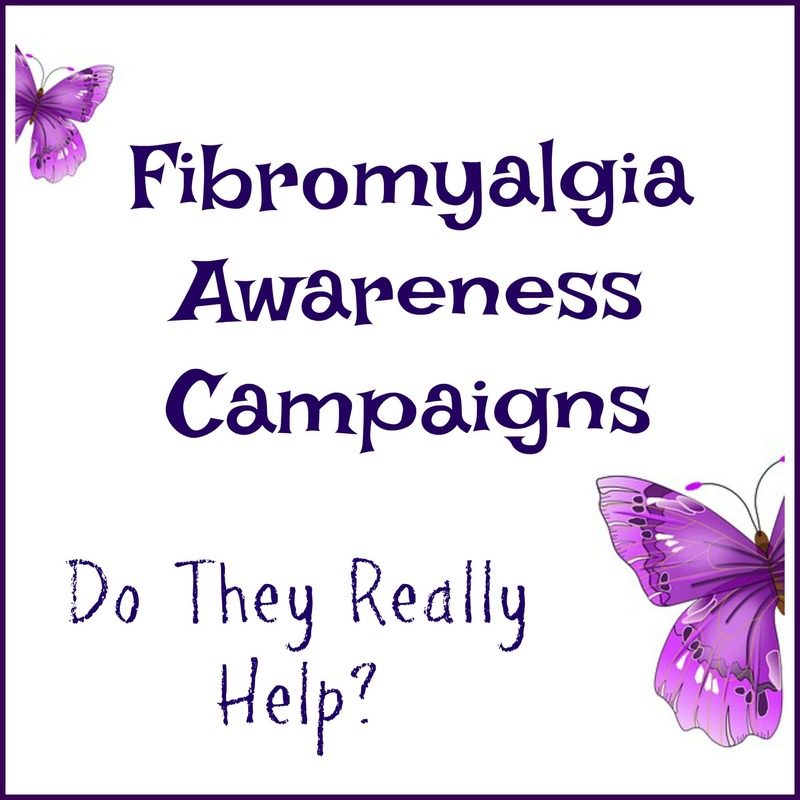 There’s another need for greater awareness in the fibromyalgia community. That is among the patients themselves. From what I’ve observed in various internet forums, it appears as if most people are not told that certain lifestyle changes may be necessary. Drugs will not make up for a poor diet, or a stressful lifestyle. Lacking is the awareness that it’s even possible to get better. Instead, fibromyalgia is treated as something that’s expected to get progressively worse. But it doesn’t necessarily have to. I’m living proof that chronic pain and chronic fatigue can get better. I’m not saying everyone can recover. But it is possible to restore your health, at least partially. I’m happy to report that I’m living a normal life again. I’m not cured, just managing my symptoms. I can’t claim or promise that anyone else will see the same results. But I can share my story. It’s now part of an easy-to-follow online course that describes in detail what I did to get healthy again. Click on the image below for more information.